We celebrate your interest in Pitzer College and encourage you to explore our pages to learn more about the impact our donors have on sustaining and empowering the College. The gratitude we feel toward the alumni, parents and friends of the College is vast, for it is only through their generosity that Pitzer thrives and transforms lives. The people, the programs, the capital projects at Pitzer: each requires important investments to move us forward and rise to our highest potential. The influence that Pitzer wields is dependent on the level of support acquired, and we invite you to become an essential partner in strengthening our impact. Invest in the future of our students who are changing the world. Advance bold ideas and curricular innovations. Tailor your contribution to make a difference in initiatives that speak to your values—a gift that is both rewarding and meaningful to you. There are many ways to give, and all are profoundly appreciated. Whatever you decide, the Office of College Advancement looks forward to working with you. We celebrate and appreciate every donor who has stepped forward to help Pitzer College, and we are delighted to highlight some of these special people. 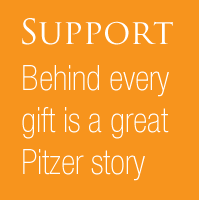 We want you to support Pitzer College with confidence. As a top private institution and member of The Claremont Colleges, we are proud of the way we manage our resources, private funding and assets.